Extreme western winds push flames and smoke through Paradise on the first day of the Camp Fire. CalFire’s most recent briefing confirmed that the Camp Fire is at an estimated 70,000 acres of damage, and is 5 percent contained. 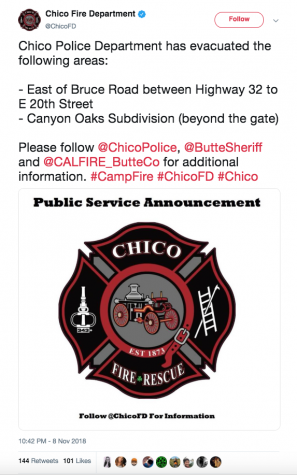 Weather conditions and firefighting efforts have prevented its movement towards Chico. 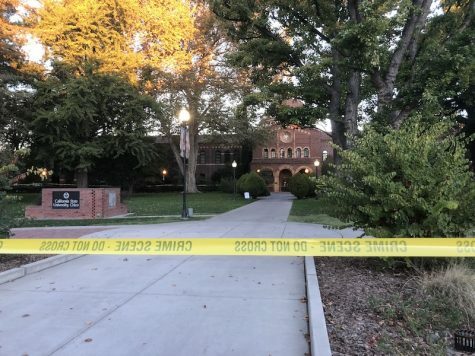 In an email to the campus at 9:19 a.m., President Gayle Hutchinson stated that the Chico State campus is closed but currently safe. 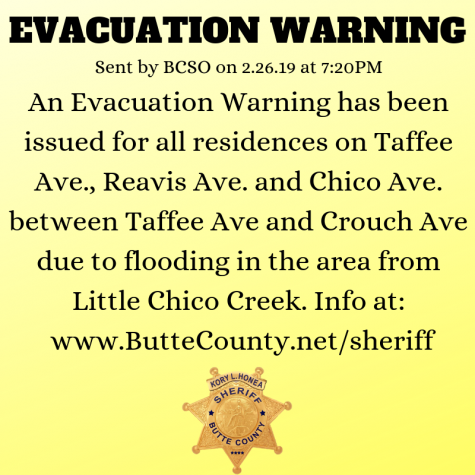 No evacuation warning or order is in effect within city limits. 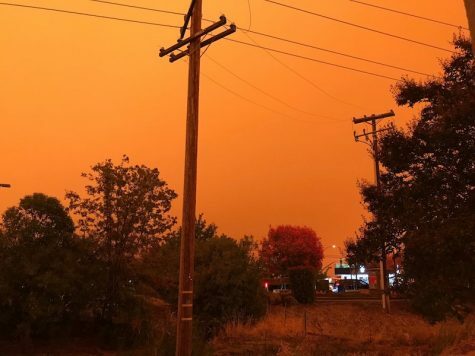 The skies in Chico on Friday morning are orange from the Camp Fire only miles away. 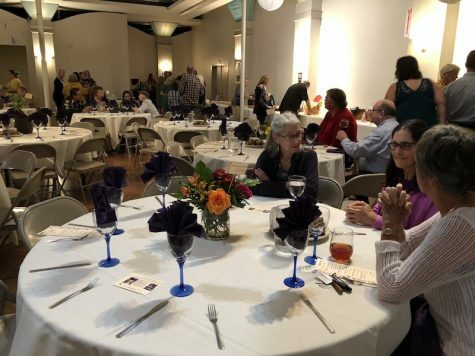 Photo courtesy of Laura Urseny – Chico Enterprise-Record. 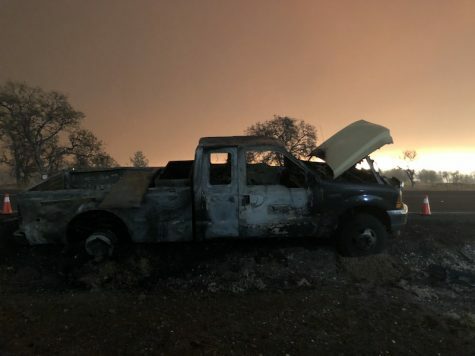 The Camp Fire remains at around 20,000 acres burned with zero percent containment, according to Jonathon Cox, a division chief with CalFire. 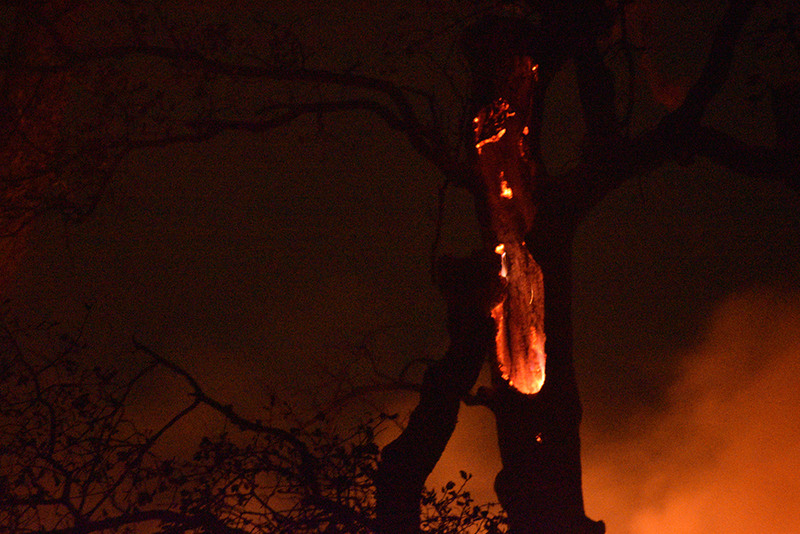 Flames burn a hole into an oak tree near Honey Run Road off of Skyway at 2:20 a.m. Friday. Two firefighters have also been injured Cox said, though the extent of the injuries are yet unknown. Multiple civilians have also been injured, he said, and around 1000 structures have been destroyed. “Probably hundreds of agencies have responded at this point,” Cox said about the influx of firefighters to the region. Tyler Garcia, 19, was in the evacuation zone east of Bruce Road but refused to leave. He said his grandfather and great-grandfather refused to evacuate—so he stayed behind as well. The fire came up to the West side of Honey Run Road while his house sat directly across it on the east side. Back on the eastern end of East 20th Street ashes where weeds and grass grew, showed that the fire had crept up to the road, but hadn’t made the jump. Fire engines had also left the area as the fire now burned further away from the nearby houses. Check back later in the morning for further updates of his ongoing situation. The Camp Fire has expanded to 20,000 acres and remains at zero percent containment, according to Bill Murphy, public information officer for CalFire. 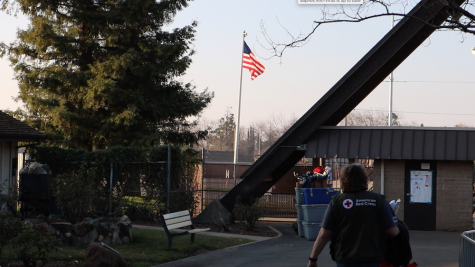 Firefighters have shown up from across the state, and have been dispatched to areas in and all around Chico. A base camp has been set up at the Silver Dollar Fair Grounds. 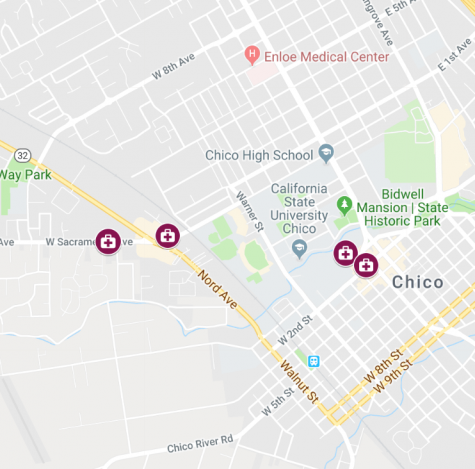 The evacuation shelter at The Neighborhood Church in Chico has been filled to capacity, but another has been opened at Pleasant Valley Baptist Church. The church also allows animals. Sam Zuckerman evacuated with his friend and his friend’s dog Molly on Thursday. 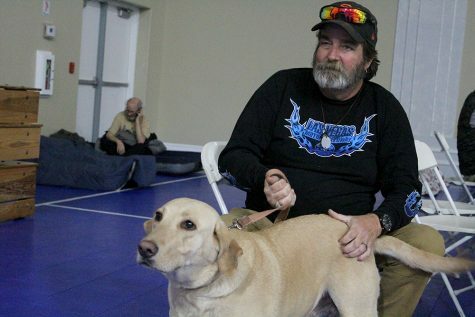 Pleasant Valley Baptist Church accepts animals. the Canyon Oaks Subdivision area beyond the gate. The Camp Fire neared East 20th street residences, but multiple fire engines arrived on scene. The situation is still ongoing, with further updates to come. 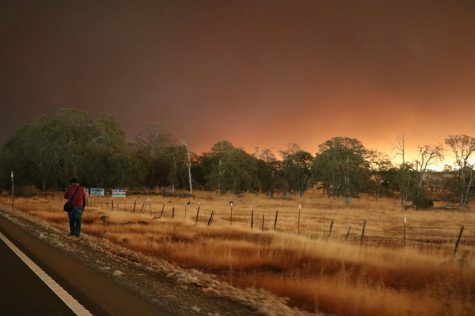 Thousands of people have evacuated their homes as Camp Fire roars on. The fast-moving wildfire began early Thursday morning in Paradise, a town with a population of 27,000, and has burned through 18,000 acres. Acting Gov. 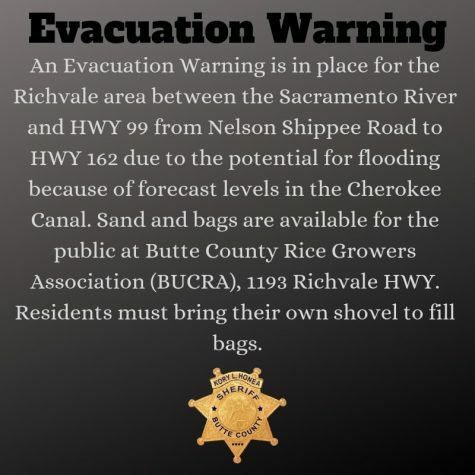 Gavin Newsom declared a state of emergency for Butte County. As of approximately 2:30 p.m., Cal Fire’s Butte unit reported zero percent of the fire had been contained. 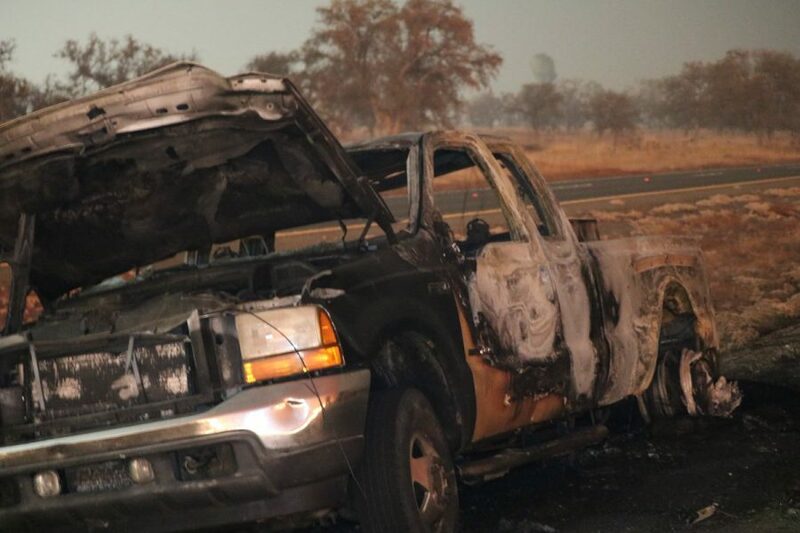 Cal Fire spokesman, Bryce Bennett, stated earlier in the day there was a possibility the fire could enter city limits. “Right now, Mother Nature is in charge,” Bennett said. 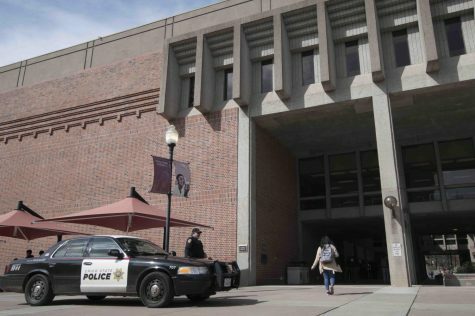 Chico State Alerts reported the university will be closed, Friday, out of an abundance of caution. This is an ongoing situation, updates to come. 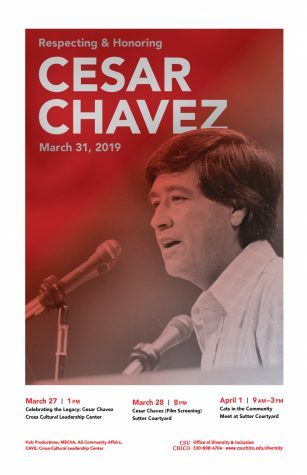 Mathew Miranda, Christian Solis, Natalie Hanson, Josh Cozine, Ricardo Tovar and Alex Grant can be reached at [email protected] or @theorion_news on Twitter.